1.0) BACKGROUND: Copy Edge was founded by Mark Gin in 1989. The company has 2 divisions: The Copy divisions for top quality Xerography and a Printing divisions for High quality Off-set and Digital Full Color Printing. 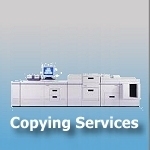 2.0) BASIC SERVICES: Copy Edge offers all of the core printing services (prepress, press and post press). 2.1) 4 COLOR PRINTING - Copy Edge has 8 modern lithographic (off-set) presses. All 8 presses can handle 2 color work. But 3 computerized presses (2 Heidelbergs) can print 4+ color jobs at 10,000 sheets per hour (1 up) or 2 presses printing 2 up turn out 40,000 sheets an hour. 2.2) Finishing-Binding - Copy Edge has 14 automated bindery systems (e.g. spiral, tape, velo, wire stitch, FastBind, glue back etc. ), 2 lamination systems, 2 automatic folders, 2 collator, stitch and fold, 6 cutters, 5 slitters, 2 counters and numberers plus other systems. 2.3) DESK-TOP PUBLISHING - Print has 18 desk-top computers (Macs to work stations) set-up to perform word processing, Desk-Top Publishing, graphics design, editing and graphic correction functions. When a client’s job arrives on a computer disk these systems refine it. 2.4) MODERN AND QUALITY EQUIPMENT - Copy Edge is equipped with 8 modern printing presses (3 are computer controlled and 2 are 1998 Heidelbergs). Out of 20 computers, 14 were built or retrofitted in the last 18 months. Even the new paper cutters are computerized. 3.0) UNIQUE SERVICES: Below are 9 services that make Copy Edge quite unique (for instance Copy Edge is 1 of only 18 printers in the Western U.S. with Direct Image Printing and it is 1 of only 2 printers in California offering Fast Press Proofs). Other Unique Services could be added to the list. 3.01) Direct Image Printing - With DIP a Client sends a job to Copy Edge as a computer disk (floppy, CD or Optical) or down-loads the data by phone line. The data goes to a server for review and on to the press (the plates are created in the press for near perfect register). 3.02) EXTENDED 8 COLOR PRINTING - Using Direct Plate Maker (plates are automatically positioned for precise register) Copy Edge provides 5, 6, 7, and 8 color printing per side. The 3 Additive Primary Color plus white or any 8 selected Pantone colors are used. 3.04) ANALOG TO DIGITAL CONVERSION - Copy Edge can take a Client’s camera-ready copy (text and art work) and convert it to digital data. Now a job can be run by Direct Plate Printing with Extended 8 Color Printing, High Screen Count Printing plus high speed and accuracy. 3.05) THERMO (4) COLOR PRINTING - Thermo Printing is often called raised printing or engraved printing. 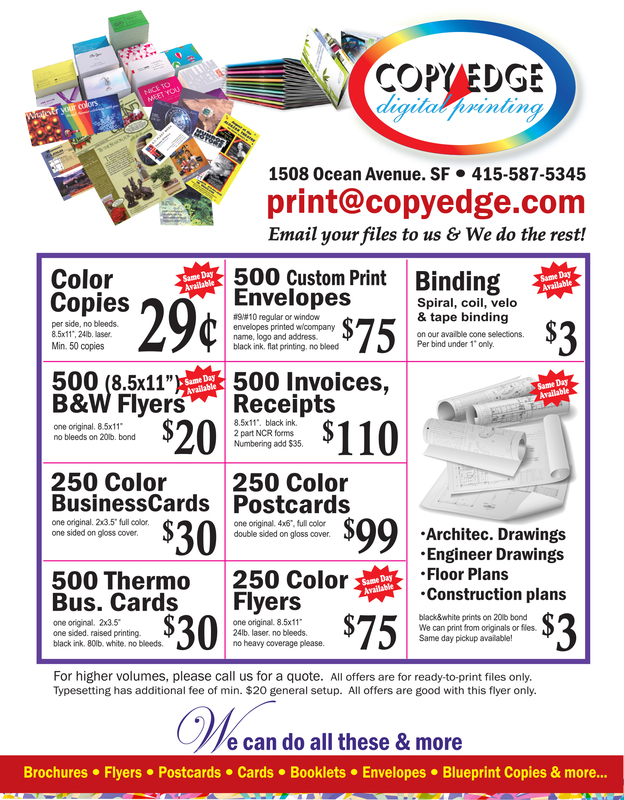 Copy Edge is 1 of only 4 U.S. printers with the specialized machine to produce 4 color or 8 color Thermographic Printing. The technique can simulate antique engravings. 3.06) COPY-PROOF PRINTING - Copy Edge has developed proprietary paper, coatings, under printing, inks and a process that produces copy-proof printed documents (for security). The system defeats making illicit copies on black and white copiers, color copiers and computer scanners. 3.07) FAST JOB PRINTING - For 1 - 4 color printing, Copy Edge has Batch Delivery (5 to 14 days) or Fast Delivery which can be “Prompt” (24-28 hours or 2 days) or “Quick” (8-9 hours or 1 day) or “Rush” (2-4 hours or 1/2 day). Fast Deliveries must be scheduled (computer Disk required). 3.08) FAST PRESS PROOFS - Copy Edge offers Fast Press Proofs for Clients, ad agencies etc. The program provides (a) Digital Service (copy is on a disk) in 35 minutes, (b) Hybrid Service (camera-ready is converted to disk) in 1.5 hours and (c) Analog (camera ready copy) in 3 hours. 3.09) JOB DELIVERY - Copy Edge has 5 scheduled van deliveries per day (every other hour) in San Francisco. The vans deliver finished jobs and pick-up new jobs. Outside of San Francisco but within the core Bay Area, van deliveries need to be prearranged and scheduled. 3.10) MASTER DISTRIBUTIVE PRINTER - Copy Edge converts the Client’s camera ready copy to a master computer disk and prints the sets needed for the West Coast or California or Northern California. Then computer disks are prepared for all selected “Global Tech-Printers”. 3.11) COMPLEX PAPER COATINGS - Copy Edge has developed proprietary printing presses, press attachments and layering machines for applying undercoats and overcoats to paper stock. This includes varnish, shellac, lacquer, plasticizer, laminate, bonder, film, dyes, etc. 3.12) ONE STOP SHOP - Copy Edge takes in multifaceted jobs and completes the work in-house but, most large printers must subcontract many segments of complex jobs (with a loss of quality control). Copy Edge means 1 stop for quality prepress, finishing and bindery. 4.0) EXPERIENCE: In 12 years Copy Edge has run just over 91,000 jobs with 53.5% of the jobs coming as subcontract work for large high volume printers (volume printers have problems with high quality color work and do not like short runs (5,000 to 30,000)). Print brokers account for 34.5% of the jobs. These brokers specialize in markets such as retailers, media, auto dealers, product catalogs, universities, nonprofits, banking, hostelry etc. Copy Edge is experienced in books, booklets, catalogs, pamphlets, dust jackets, product sheets, announcement sheets, mailers, posters, displays, CD cards, “J” cassette cards, inserts, fold outs, presentation folders, cards etc.